Christmas around the world is a magical time of special foods, drinks, parades and festivities. One of the biggest form of celebration, especially in Europe, are outdoor Christmas markets. The markets are a time for gingerbread and mulled wine, with lights galore and live music in beautiful historic town centers. Here are the best Christmas markets around the world! Nobody does it better than Munich! With more than 20 different markets spread throughout the city, the residents know how to Christmas justice. Wander long enough and you’ll stumble upon student markets, puppet shows, and a picture-perfect market. Christkindlmarkt is the city’s oldest and biggest, 150 wooden huts selling toys, gingerbread and mulled wine in the historic heart of the city. Start at the Marienplatz to marvel at its distinguished tree, before you escape to the nearby Kripperlmarkt am Rindermarkt, where you’ll find Munich’s largest nativity scene. The Schwabinger Weihnachtsmarkt is great to pick up that unique gift—started by local artists in the 1970s, you’ll find everything from quirky ornaments, to handcrafted jewelry, to traditional landscape paintings. Be sure to stop by the Mittelaltermarkt, a market that celebrates all things medieval—with colorfully attired minstrels, archers, merchants, and jesters—and pick up a drinking horn or two. December is a time of frosted lights, traditional tunes and mulled wine. Zagreb, already so picturesque with its twin-spired cathedral and cafe-lined pedestrian streets, doubles its appeal come Christmas time. During Advent, the city erupts into festivities such as singing, dancing and live music. Visitors can also enjoy ice-skating in the open-air rink in King Tomislav’s Square! With its pristine white architecture and old world cafes, Vienna turns into a wonderland during Christmas. Markets pop up here and there, and the scent of roasted chestnuts and Glühwein permeates the frosty air. The Museums Quarter unveils elegant light installations, ice pavilions, handblown glass and an ice-curling rink. The City Hall Square explodes into a festive sea of lights, gifts, tree decorations, craft workshops and a carousel. 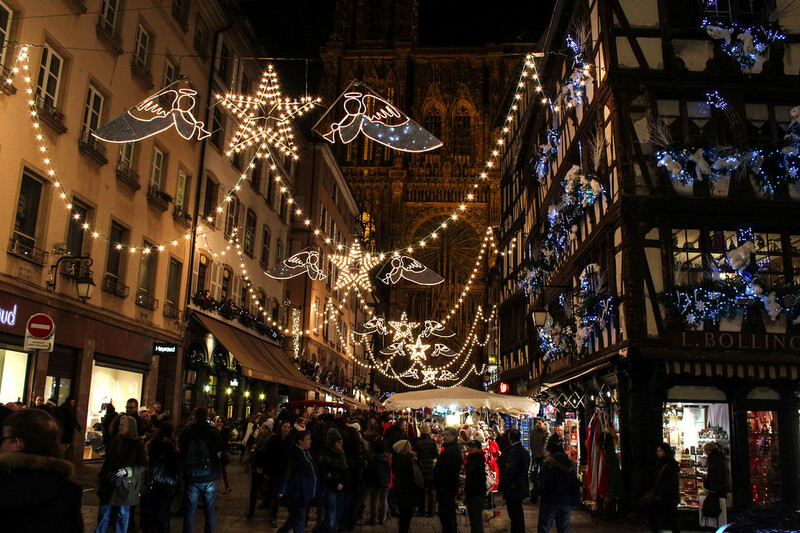 Strasbourg is home to the oldest Christmas market in Europe, the Christkindelsmärik, which dates all the way back to 1570. With over 300 stalls spread over 12 mini-villages, the little Alsatian town has won Best in Europe multiple years. Part of the draw is the picturesque setting: half-timbered houses, elegant lights and white stars and angels suspended above cobbled streets. Here you’ll find four Advent concerts, authentic live music and a Living Nativity. Make sure to stop by the Place Kléber for its impressive fir tree and pick up bredele. These special Christmas biscuits come in hazelnut, orange, praline, cinnamon, walnut, just to name a couple. Scandinavian Christmas erupts on the streets in front of the Nobel Museum in Stockholm. For one month before christmas, snow-dusted stalls offer handcrafted glass, pottery, jewelry, as well as glögg and thin ginger biscuits called pepparkakor to keep you warm. Here you can find saffron buns and reindeer-meat sausages! 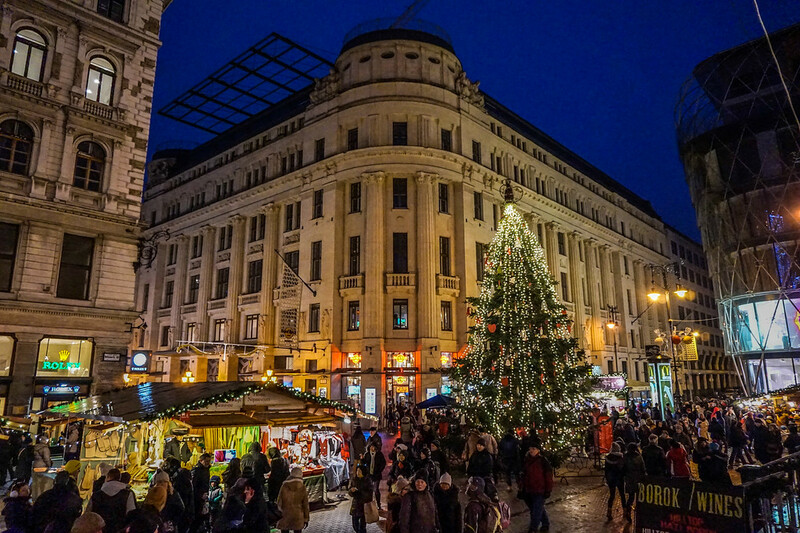 Enjoy Eastern Europe’s spin on things by visiting Budapest’s Christmas Market, which lasts nearly two months. Over 100 wooden pavilions cluster in Vorosmarty and St. Stephen’s Square and sell their special mulled wine, cinnamon chimney cakes and toki pompous (baked dough topped with bacon, onion and cream). At the market you can find crocheted goodies, fur hats, pressed flower jewelry, handmade honey cakes, and iron candelabras. I loved the Christmas markets in Hamburg and Tallinn, but am very excited to add a few more to my list next year! I arrived just after the christmas markets in Munich had ended, but I´m pretty sure I´ll get a chance to go see them, as I have a cousin living there. And as they´re all over the place in Germany, I went to a few in my region. But I didn´t know so many countries had them!